You may worried about your website Pelalties from Google. I know the feelings of getting Google Penalties. I saw lots of people out there and even one my site got Google Penalties. 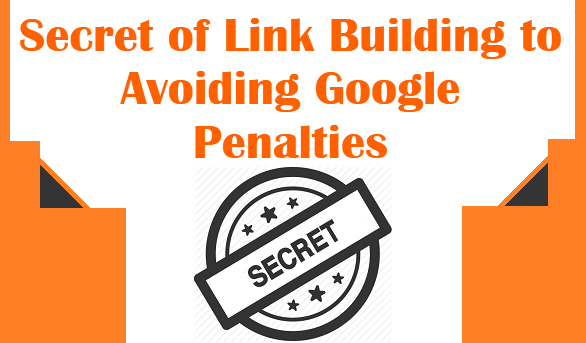 This is one of the worst thing ever if you don't know what can be the cause of penalties and you are still doing blogging or creating new web for business purposes and doing SEO without following good instruction just by following old SEO link building way. Even its important for all newbie bloggers. About few years, Google has made SEO of link building very difficult for a racial business owner to get them found online search. They have really clamped down on what they do like & don’t, leaving typical site owner confused and now worried about online marketing efforts. Ultimately, this is a force for them to buy online ads to get business seen to the specific local or worldwide customers. Google ranking algorithm have changed and same way the type of building links which required to rank that also have changed as well as. The system of link building has gone from being just making huge backlinks. Now its time to working carefully about make those link buidling things looks as natural and even organic as possible. Here, the purpose of my discussion is I have found in testing to be most effective. And you don’t have to be afraid of Penguin, Panda, Hummingbird and whatever the other change of Google has in their store. ✓ Anchor Text: Getting your direct domain backlink should be 70% Example: "www.yourweb.com", Long Tail Anchor Text should be 10% Example: "SEO Tips For Blogger", Random backlink should be 10% Example: "Click Here, Read More" and Targeting Keywords should be 10% Example: "SEO Tips". This can be the most important thing for Off Line SEO that you should focus on while building links. Over Optimizing of targeting keywords is the Quickest way to get penalty from Google and mostly its impossible to fix. ✓ Relevancy: If your site is about any specific niche as like Health or Diet then health related sites backlink would be relevant for your site. At present, Google Ranks and values links which comes from relevant sites more and it may will be continuous in future also. Consequently, getting the links from related websites or niches is not only helps to rank your site but also it helps to guard you site against future algorithm changes. ✓ DoFollow & NoFollow: When we are creating backlink in html code most of the time we use attribute (rel="dofollow") for dofollow backlink and sometimes without using this tag randomly it creates with attribute (rel="nofollow") which is nofollow backlink. Google says that certain interlinking or any kind of purchased link between the sites which have a nofollow attribute to let the google knows and not to ranking the page between the sites. Now you should know and should always remember that whatever those links are nofollow or dofollow, all those quality links can get you rank for your site. ✓ IP Diversity: When building links, as like its important to get backlinks from a variety of sites, same as its also important the sites that are on variety of C Class IP addresses. This is also a useful thing that Google checks and put in place to prevent one site against another for manipulating the site rankings. ✓ Home vs Interior: Follow the short calculation of percentage (Home page 80-90% and Interior pages 10-20%). When building links, you have to be sure to give some links love to the interior pages. Not for only its natural, but it also will help those interior pages to get rank better. ✓ Total Links & Indexed Links: Its not applicable for Link Building now. You should not worry about doing counts backlink in Google/Majestic/AHREFs. Every system has unique way of computing total links which changes periodically. At present and also for the future you should not have to create huge backlinks for your website. There have lots of bad backlink that can be created more than good backlinks. Further, only Ten high quality backlinks are better than the Thousands of low quality backlinks. So you should focus on only get High Quality Authority backlinks.